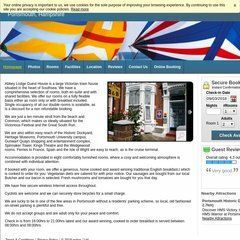 abbeylodge.co.uk Abbey Lodge Guest House Quality Accommodation in Portsmouth .. It is hosted by Entanet International Ltd (England, Shropshire,) using Microsoft-IIS/7 web server. ASP.NET is its coding language environment. metric.viper.enta.net, ns.enta.net, and ns2.enta.net are some of its 4 Nameservers. PING www. (78.33.24.25) 56(84) bytes of data.